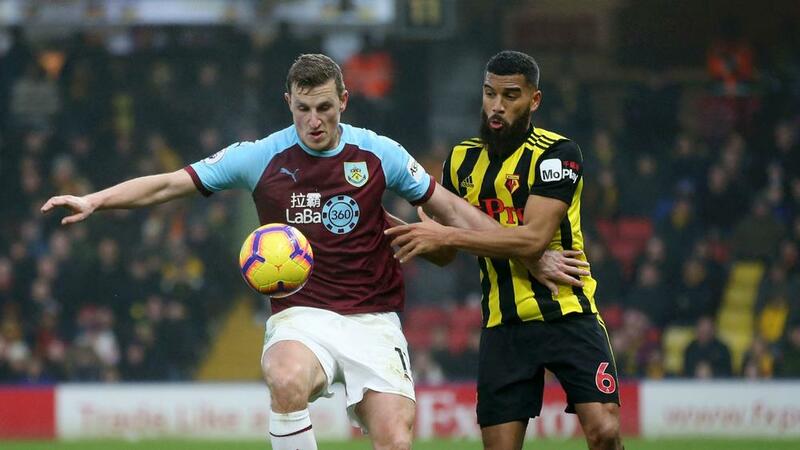 Chris Wood was denied a stoppage-time winner by a marginal offside decision in Burnley's entertaining 0-0 draw against Watford at a sodden Vicarage Road. New Zealand international Wood tucked home after Ben Foster spilled a shot from Dwight McNeil in the 92nd minute, but was adjudged offside despite appearing to be in line with Jose Holebas. With the goal ruled out, Burnley failed to extend their winning run in the Premier League to four matches, having picked up important victories against Huddersfield Town and Fulham in their previous two. Despite seeing Gerard Deulofeu and Ken Sema go close early on, Burnley worked their way back into the match and will feel aggrieved not to have taken all three points. Deulofeu should have put Watford ahead, but was unable to beat Tom Heaton in a one-on-one situation inside 90 seconds, while James Tarkowski's goal-line clearance kept Sema out in the fifth minute. Burnley eventually found their feet as Ashley Barnes – who appeared to control the ball with his arm – spurned a glorious opportunity by slicing Adrian Mariappa's header wide from the edge of the six-yard box. Troy Deeney would have punished that miss on the stroke of half-time had Heaton not parried his half-volley from Kiko Femenia's cross away. Burnley remained on top after the restart and Foster got an important touch to Jeff Hendrick's attempt to finish off a counter-attack, before McNeil blazed a six-yard volley over in the 55th minute. Heaton displayed great awareness to stop Tarkowski inadvertently putting through his own net and Tom Cleverley saw a low drive held by the Clarets goalkeeper as Watford asserted themselves again. Watford lost Femenia to an injury in the 77th minute before the late drama as Wood tucked home after Foster failed to hold McNeil's 20-yard drive, only for a marginal offside decision to deny him the winner. With relegation-threated Newcastle United and Cardiff City going head-to-head on Saturday, Burnley failed to take an opportunity to increase their advantage over the bottom three. With Newcastle overcoming Cardiff 2-0 at St James' Park, a draw at Watford means the Clarets simply remain three points clear of the relegation zone. A victory would have sent them up to 14th. Heaton's return to the starting line-up at the expense of Joe Hart has coincided with Burnley's upturn in form and he produced another strong display. He read the play well and showed great positioning to keep out Deulofeu and Deeney before half-time, while he also stopped Tarkowski putting through his own net in the second period. With Abdoulaye Doucoure, who has been linked with a move to Paris Saint-Germain, absent due to a knee injury, Cleverley partnered Etienne Capoue in the centre of midfield. The former Manchester United man may be a different style of player, but he struggled to make a mark on the game - he had a passing accuracy of 77 per cent and failed to create a single chance for his team-mates. The fourth round of the FA Cup sees Watford travel to face Newcastle United and Burnley head to the Etihad Stadium for a meeting with Manchester City on Saturday.